EAGAN, Minn. — The Minnesota Vikings lost a key member of their offensive line Thursday when left guard Nick Easton was placed on injured reserve because of a bulging disc in his neck. Coach Mike Zimmer made the announcement at a news conference. Easton hadn’t practiced since Aug. 3 because of the injury. He started 12 games in 2017 and five games the year before, playing both center and guard. Minnesota signed Easton to a one-year, $2.9 million contract in free agency. He’ll be an unrestricted free agent after the season. 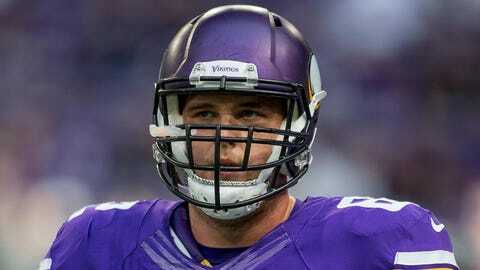 The Vikings are also missing center Pat Elflein (ankle/shoulder) and right guard Mike Remmers (ankle). Minnesota may turn to veteran Tom Compton to replace Easton. The Vikings acquired the Minnesota native in free agency after he spent one year with the Chicago Bears. Before that, he played for the Washington Redskins and Atlanta Falcons. Second-year players Danny Isidora and Aviante Collins may be in the running to increase their role at guard. Easton was acquired by the Vikings in a 2015 trade from the San Francisco 49ers. He played his way into a starting role with the Vikings but missed the playoffs last season with a broken ankle that sent him to IR. His latest injury may cost him the entire 2018 season. “He’s a tough guy that does a great job of finding a way to get his job done,” Zimmer said earlier in the week. Minnesota plays its first preseason game Saturday night against the Denver Broncos.